His last name just screams success. 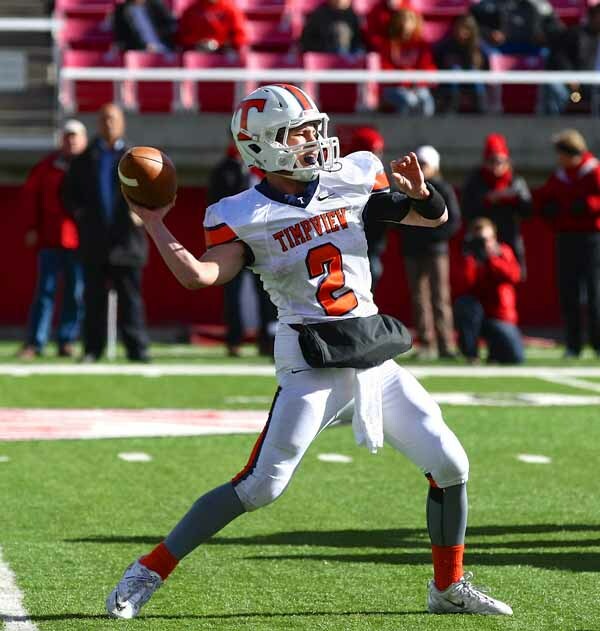 You hear “Covey” and you just expect excellence to follow, and with Timpview High quarterback Britain Covey, that is what you get. At one time, Covey had his eye on medical school, but recent experiences with a large-scale fundraising project for Sub for Santa have him thinking more about going into business. In the end, he might change directions, as he does so well on the football field, and move from the gridiron to the stage. 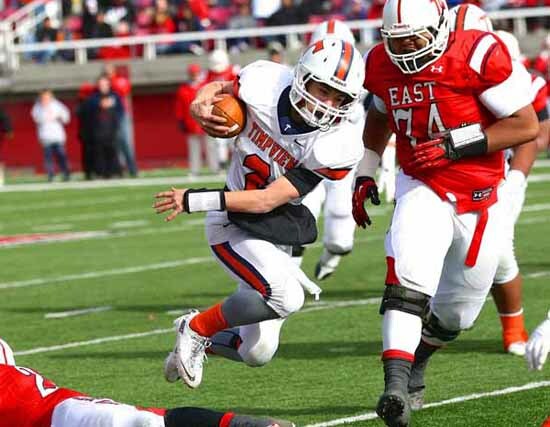 Assuming he stays on target as an athlete, Covey has created an opportunity for himself at a school that has yet to be selected to compete as a scholarship football player. It’s not likely that he will move to the next level as a quarterback, but his skill set cannot be ignored. So, what is the story behind the super speed and lateral quickness that Covey uses to elude even the state’s most talented defenders? Part of it is genetics, he says, but the rest comes from study and learning how he can be more productive and effective. 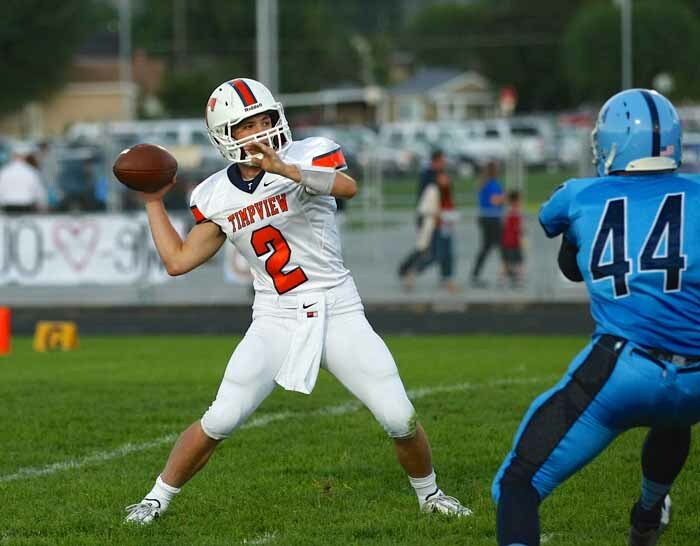 When you’re 5-foot-10 and 170 pounds, you aren’t blessed with typical quarterback size, so the Timpview signal caller takes full advantage of what he does have. The Coveys have always been quarterbacks. Britain’s uncle Sean, who played the position at Brigham Young University, was a star quarterback at Provo High, and his two older brothers, Stephen and Christian, preceded him as Thunderbird passers. 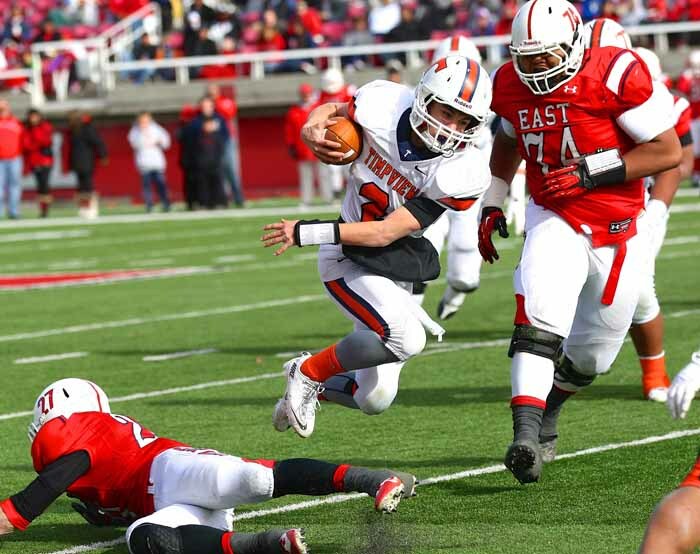 But Britain did want to play football and he really wanted to be the Timpview quarterback, even when it did not look like it would happen. At the beginning of his junior year, he was used very much the way Whittingham suggests he will be used in college, as a slot receiver and a kick returner, and he had success. Covey had a different feeling, but he was most concerned with being the player his coach and his team needed him to be. “I wanted to be a quarterback for sure, watching both of my brothers,” Covey said. “There’s just something about the quarterback position that lets you use leadership skills, lets you use your knowledge. Also, it’s just a lot easier to run from the quarterback position than it is from the running back position. You’re a threat in so many ways. Covey returned kicks for touchdowns in the first two games of the 2013 season, and he scored on long pass plays in the Thunderbirds’ opener against Sky View as the team found ways to get him the ball in space. 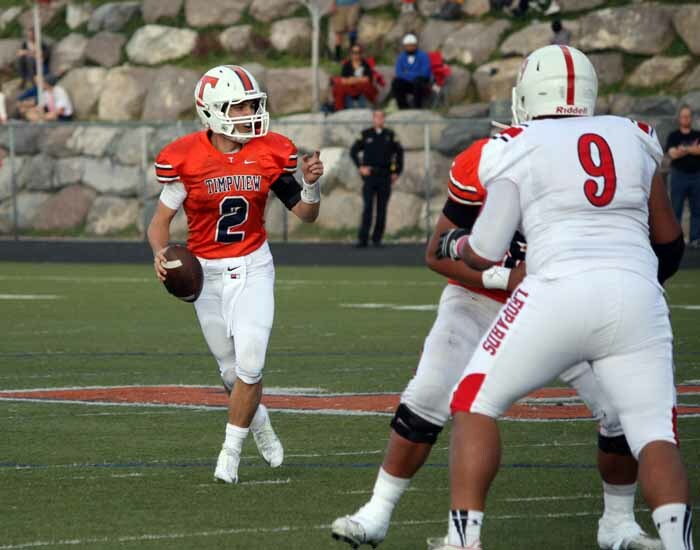 But, in Week 2, after he housed the opening kickoff against Pleasant Grove, the Vikings double-teamed him and the Timpview offense sputtered. “That was frustrating to me because I was calling audibles from the receiver position like seeing ‘this guy’s got one-on-one coverage because there are two guys on me, change to a post.’ But, being a receiver, you can’t execute it,” Covey said. With an injury impacting junior quarterback Isaiah Holloway’s ability to continue at the position, a change was made and Covey found himself playing quarterback. Once he started making dynamic plays all over the field, he was there to stay. While his running captures a lot of the headlines, Covey is most excited about his ability to throw the ball. He says he much prefers a 300-yard passing performance to a 200-yard rushing game. Timpview’s opponents have certainly experienced what Covey describes. He is very difficult to defend, especially when he is throwing the ball well. This season, Covey has run for more than 1,400 yards and passed for more than 2,000. He completes nearly 70 percent of his passes, both this season and over the course of his career. His impressive stat line also includes close to 50 touchdowns in 2014, and more than 90 over the past two campaigns. “I love having a high completion percentage because I feel so confident back there,” Covey said. “I watch a ton of film and when I get back there, I just simplify things – this read, this read, run. It makes it a lot easier. It’s that comfort that makes everyone else in the state nervous when they see Covey coming. In the 2014 postseason opener against East, Whittingham showed how far he will go to get the ball into his playmaker’s hands. With the T-Birds struggling to score points, he put his quarterback in the game as a punt returner. Then, with Timpview facing a fourth-and-12 inside its own 20-yard-line, Covey was in punt formation, but he did not kick the ball. It was the third quarter of a seven-point game and the speedy Covey took off as soon as he caught the snap. Before the Leopards could react, he had picked up a huge first down. The playoffs is also the time the Thunderbirds break out all the stops on offense. Covey actually sees size as one of his advantages, at least most of the time. What’s next for Britain Covey, once he finishes high school? He hasn’t decided yet if he will head straight out to a mission for The Church of Jesus Christ of Latter-day Saints, or if he will play a year of college football first. He does believe that coming from a football family, and most recently a Timpview football family, has always been a blessing for him.